The 3 cyclinder Volvo engine is believed to have just over 300 hours starts and runs clean and well. She has dual helm positions with single lever controls to a reduction gearbox, shaft drive with a Halyard deep sea seal. Sails could do with some attention but appear lightly used. Fwd cabin has Vee berth (2 singles) or double with infill, hanging locker and ample storage and is ensuite to heads. Aft cabin is good sized double berth with light and ventilation, good storage lockers and a handbasin. The saloon table drops easily to form the third double berth, the extra cushion stored neatly away when not in use. The heads/shower area is vast for a boat this size and is accessed from saloon and fwd cabin. Hot water is provided by a calorifier and immersion and heads pipe replaced 2018. The galley is sensibly laid out for use and for storage and is well equipped. The cooker was new 2006 and looks barely used. Smoke alarms fitted (one in engine space) and fire extinguishers (not tested) and fire blanket aboard. Moody Yachts (built by Marine Projects of Plymouth) need little introduction. The Eclipse range are deck saloon (pilothouse) style cruising yachts and although they were marketed as motorsailors that I think discredits their performance rather as they are reviewed to sail well. The Eclipse 33 has packed a lot of accommodation and storage into a fairly compact length but has remained to me a good looking boat, certainly not typical of motorsailor lines either. The deck saloon makes her feel spacious and light and really pleasant to be aboard and the dual helm stations allow for the (sometimes not so great) weather to not be too offputting. This example had in particular a meticulous second owner who had her since 1998 until recently. Everything appears to have been well maintained, kept clean and well ordered. She is well equipped and there are manuals aboard for everything! Within the last 10 years she has been re-rigged including a new Furlex. 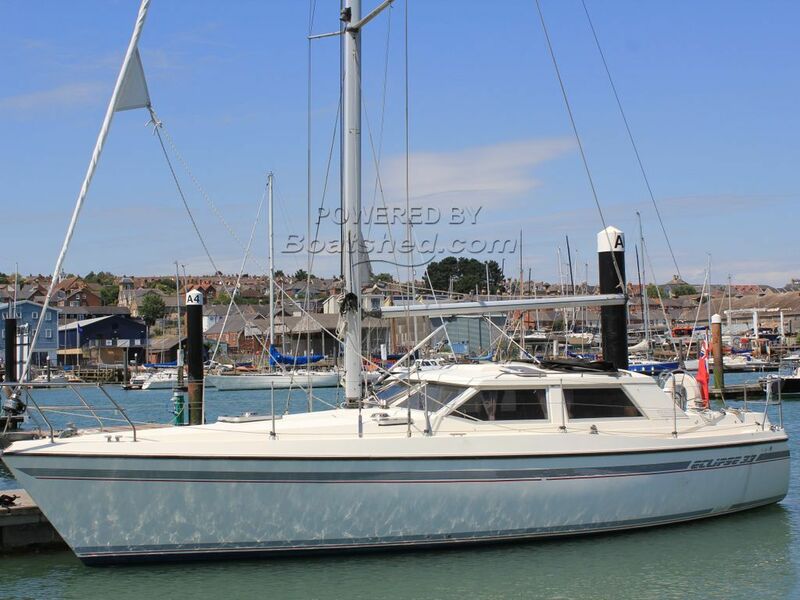 This Moody Eclipse 33 Mk 1 has been personally photographed and viewed by Corinne Gillard of Boatshed IOW. Click here for contact details.